General Motors Co and its Chinese partner SAIC Motor Corp signed an agreement on Tuesday to develop and build electric vehicles in the world's largest auto market. 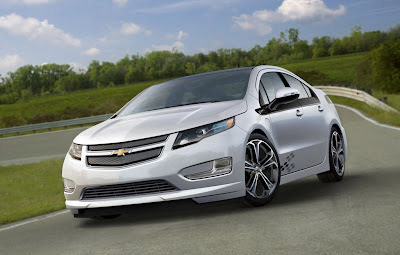 The deal will allow GM and SAIC to eventually offer electric vehicles (EVs) that qualify for expected Chinese "green" subsidies, something GM's Chevrolet Volt plug-in hybrid electric car does not qualify for since it is not built in China, GM Vice Chairman Steve Girsky said. The subsidies would provide buyers with a discount, either before or after purchase. The Volt will go on sale in China later this year, but without the subsidies that can cut prices roughly 30 percent. Girsky said GM hopes China eventually extends the green subsidies to all vehicles. Industry observers and U.S. lawmakers have said that by limiting the subsidies to locally built models, the Chinese government is pressuring companies like GM to share advanced technology with its Chinese partners. "The basic, unpublished rules look like this: If you want approvals to build more Buicks and Chevys in China ... you should first agree to transfer EV technology," said independent China auto analyst Michael Dunne. "The price of access to the world's No. 1 car market just went up a few notches," added Dunne, who wrote "American Wheels Chinese Roads: the Story of General Motors in China." GM officials deny facing any pressure. "We've had no requests for intellectual property around Volt from our partner, SAIC, or the Chinese government," Girsky said on a conference call. GM currently has no plans to build Volt in China. "This is not a political decision. This is a business decision." China has set an ambitious target to have 1 million green vehicles on the road by 2020, up from a few thousand at best currently. J.D. Power and Associates estimates the EV market in China will not reach 200,000 sales until 2015 at the earliest. "We're making guesses here, but we do not want to be left out," Girsky said, when asked how big China's EV market could get. Girsky compared the SAIC deal to one announced last month with South Korea's LG Corp to design a range of EVs to be sold around the world. He said the SAIC deal would make EVs for China, and the LG deal would serve the rest of the world. Last year, the Chinese government unveiled a pilot program to hand out subsidies to buyers of fuel-efficient cars in five Chinese cities as it moves to cut emissions in the world's most populous country, which is also the world's largest producer of greenhouse gases. It is still finalizing those regulations. But those subsidies, which favor electric vehicles and plug-in hybrids, may only cover locally made green models, reflecting Beijing's resolve to promote domestic brands and locally built products. That potentially could put GM's Volt and Nissan Motor Co Ltd's Leaf at a significant disadvantage by making the vehicles too expensive for many Chinese buyers. Nissan, which will begin selling the Leaf in China later this year, previously said it would build an electric vehicle with its Chinese partner in that market by 2015. GM and SAIC said their Chinese joint venture's engineering and design operations will develop the new architecture as well as key parts. Girsky said it will be a dedicated electric vehicle platform and not based on current models. The companies, which are making equal, undisclosed investments in the project, said product details and timing will be announced at a later date. J.D. Power analyst Mike Omotoso said the SAIC venture could develop its EV within two three years. The Shanghai GM joint venture introduced the Chevy Sail electric concept vehicle late last year. Vehicles developed under the partnership will be sold in China under Shanghai GM and SAIC brands, and GM will use the platform to build electric vehicles globally. The agreement finalizes a nonbinding memorandum on cooperation for green-vehicle development SAIC and GM signed last November. At the time, SAIC agreed to buy a 1 percent stake in GM through an initial public offering held to make GM a public company again and cut the U.S. Treasury's holding in the company. The Shanghai GM joint venture builds Chevy, Buick and Cadillac vehicles in China, and dates back almost 15 years. GM's board of directors met China this week -- the first time ever outside the United States.